Donovan was shooting a 28″ 8-Twist Shilen, 105 Berger VLDs (Lot #0559), with a 32.0+ grain load of RL15. (Donovan notes his barrel is pretty fast so other Dasher shooters may need more powder to reach the same velocities.) Temperature was at 84° F, and altitude 1325 feet. Pressures were measured with an RSI Pressure Trace, and velocities were recorded with a CED Millennium chrono set up with 8-foot spacing and infrared lighting. Donovan has also been comparison testing the 115 DTAC vs. the new 117gr Tubb bullet. We hope to have a complete report on those results in May. Regarding the 115s, Donovan had this interesting gunsmithing note: “I have an older Shilen barrel that had a .104″ throat up until last December. I had been using it for 105 types mainly. 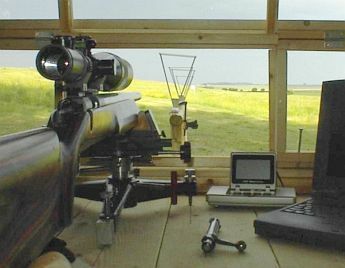 It had always shot Berger 105-VLDs about the best, then AMaxs, followed by 107gr SMKs and then 105gr Lapuas. I had even tried the 115 DTACs with it a few times, but it shot them marginal to say the best. Then I felt the accuracy had diminished somewhat and it had near 1200 rounds down it, so I decided to re-crown it and throat it longer to get past some of the erosion. I pushed out the throat to .165″. Interestingly, in December this re-throated Shilen shot the 115s best followed by 107 SMKs and then the older lot of Berger 105s. At 1000 yards, two 5-shot groups of 115s both went under five inches.” What’s the lesson? Don’t toss that old barrel–you might find it shoots great with a fresh crown and new throat. Share the post "Field Report–Reloader 15 and new Berger 105s in Donovan's Dasher"